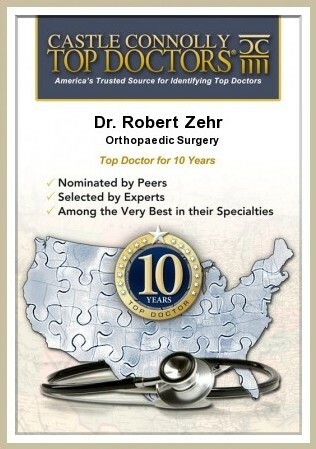 Zehr earns "Top Doctor" honor for 15th consecutive year - Orthopedic Surgeon For Hip, Knee Surgeries at Zehr Center In Naples Florida. NAPLES, Fla. (February 11, 2019)–Castle Connolly Medical Ltd., America’s trusted source for identifying Top Doctors, has chosen Naples orthopaedic surgery specialist Dr. Robert Zehr for inclusion in its highly selective list of Regional Top Doctors this year. Fewer than 35,000 physicians – less than 5% of the nation’s licensed physicians – have been selected as Castle Connolly Top Doctors in their regions for their specialties. 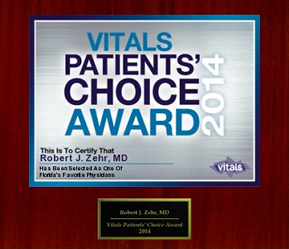 Dr. Zehr has earned this distinction every year since 2004. 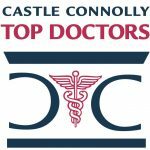 Castle Connolly Medical Ltd. identifies top doctors in America and provides consumers with detailed information about their education, training and special expertise in printed guides and online directories. It is important to note that doctors do not and cannot pay to be included in any Castle Connolly guide or online directory. The exhaustive process of naming a Castle Connolly Top Doctor begins with thousands of interviews. Because the Castle Connolly honors are determined by their peers, surveys are sent to physicians and healthcare professionals. In addition to mail and online surveys, the Castle Connolly physician-led research team makes thousands of phone calls each year, talking with leading specialists, chairs of clinical departments and vice presidents of medical affairs, seeking to identify top specialists for most diseases and procedures. Dr. Zehr performed the first same-day outpatient total hip replacement surgery in Southwest Florida, at the newly established Seaside Surgery Center, which he founded. He continues to provide innovative treatments for his patients, such as Alpha-2-Macroglobulin plasma therapy for knee osteoarthritis, available in Southwest Florida only at the Zehr Center for Orthopaedics. The Zehr Center for Orthopaedics is located at 2659 Professional Circle, Suite 1110 in Naples, Florida. Dr. Zehr certainly is the best of the best. I hold him in the highest regard and would recommend him to anyone in need of a knee replacement.